Designed to support copper and fiber cabling, PANDUIT Cable Management Rack Systems provide a complete system solution to manage, protect, and showcase equipment and structured cabling investments. Industry experience and quality engineering of PANDUIT solutions result in superior products designed for optimum cable management. PANDUIT products help effortlessly route and organize cable for ease of installation and future maintenance. As new technologies emerge, network cabling performance is pushed to the limit. Today's complex systems depend on robust cable management for increased reliability. PANDUIT racks and cable management systems are designed for maximum performance and protection of network cabling, resulting in ultimate system reliability. PANDUIT rack systems control and conceal cable pathways to enhance system appearance. Well-organized cable management makes any telecom room or data center a showplace and demonstrates your commitment to technology. PANDUIT rack systems allow complete flexibility for a wide range of cable and equipment combinations and are designed to maximize cable access. Vertical cable managers allow increased cable density for maximum space utilization and organization. This provides a cost-effective solution with easy cable access and ultimate cable protection. PANDUIT offers a variety of horizontal cable managers to provide additional pathways for increased management and control of copper and fiber patch cords. PANDUIT offers a complete selection of standard, angled, high density and powered patch panels to fit each unique application. Modular designs accommodate a full range of media types and performance levels to provide flexibility and scalability for changing network requirements. 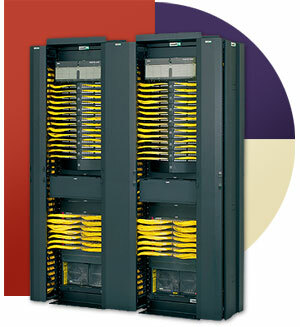 OPTICOM Rack Mount Fiber Enclosures provide a high-capacity, high-density connection point with optimum management and protection of fiber cable. PANDUIT STRUCTUREDGROUND System for Data Center Grounding provides a high quality, visually verifiable, and dedicated grounding path to ensure highest network system performance and protect network equipment and personnel. PANDUIT raised floor grommet reduces bypass airflow around cables that penetrate the raised floor, thereby reducing energy costs and improving network reliability. Click here to learn more about Cable Management Solutions for Data Centers and Telecommunications Rooms!